Thank you, John for this summary of the El Nino weather pattern and its possible effect on the futures market. 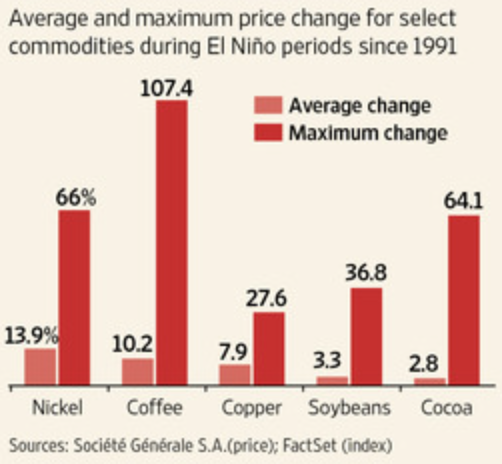 Maybe the El Nino will be the reason given if commodities rally back from their current low prices. Interesting that gold and silver follow a similar price pattern to the Ag sector, so maybe next year or two will be rally mode for those as well. 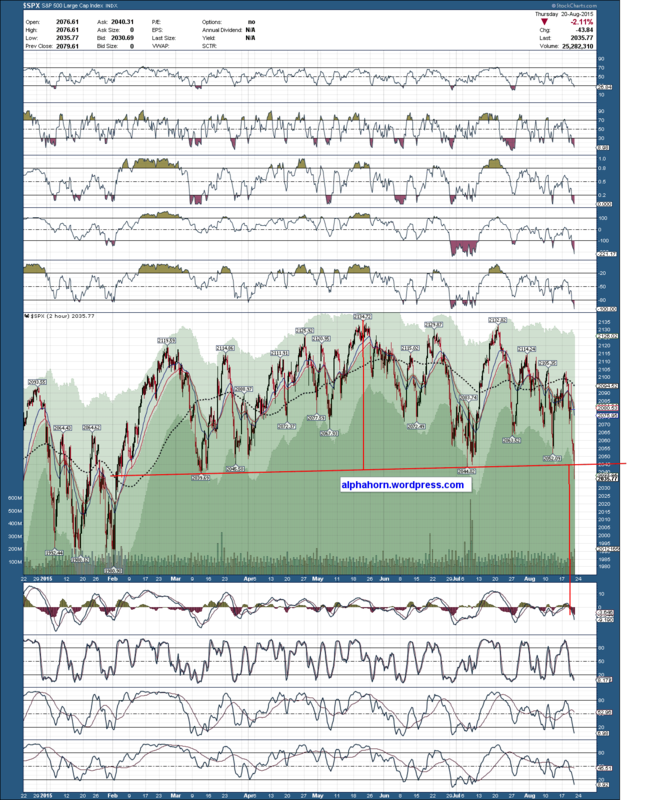 Are you buying here for target of spy 210. As Agricultural Index made a high in 2011. 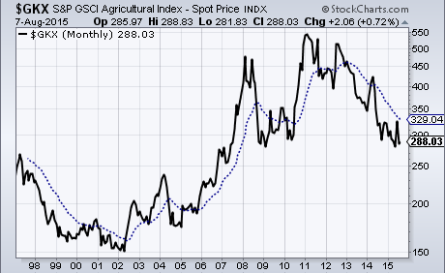 It’s possible that Livestock Index has made a high in 2014. Of course, if El Nino hits there may be other ways to play it, such as the property and casualty group. From the short side? Any names recommended? The damage to property in California could (I emphasize could) run into the multi-billions of dollars. I’d look to see who are the major P&C companies with exposure there, Inc reinsurers. This is not the warmest year on record. The NOAA (The Ministry of Propaganda) has been caught doctoring climate records way too many times. They have taken the data records from sites and made them COOLER thus making it appear it is the warmest on record now. This is B.S. UAH NASA satellite data is recognized as the most accurate global temperature tracking tool since inception in 1979. 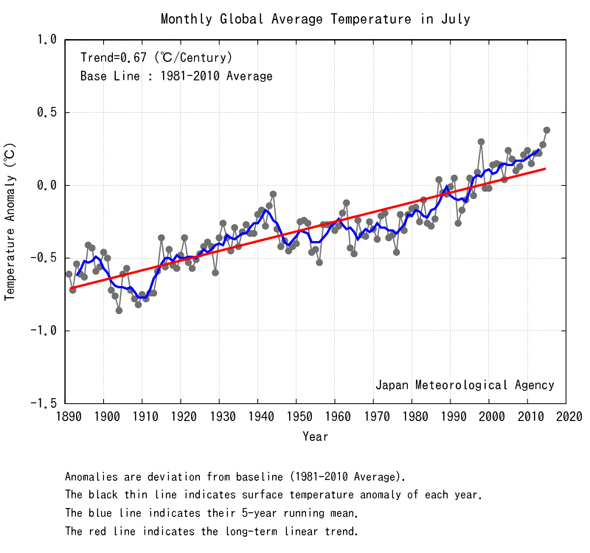 The latest analysis for July had it not even close to being warmest ever globally. In fact there were 8 warmer in just the last 20 years. 1997 had a global July anomaly of +0.5C. This July just +0.18C. RSS, the other scientific satellite data sensing assessment service in California agrees with UAH and finds this July was 8th warmest in the last 20 years. Both UAH and RSS show no global warming (called the pause) for over 18 years. NOAA NCEP (the analysis and forecasting group that can’t afford to play political games) does a global analysis of temperatures 4 times a day for initialization of their forecast and climate models (that are run 4 times a day). Weatherbell.com compiles this gridded global data and for July it shows an anomaly of just 0.15C, very close to the satellite assessment of the lower atmosphere and a fraction of the exagerrated NOAA surface estimate. 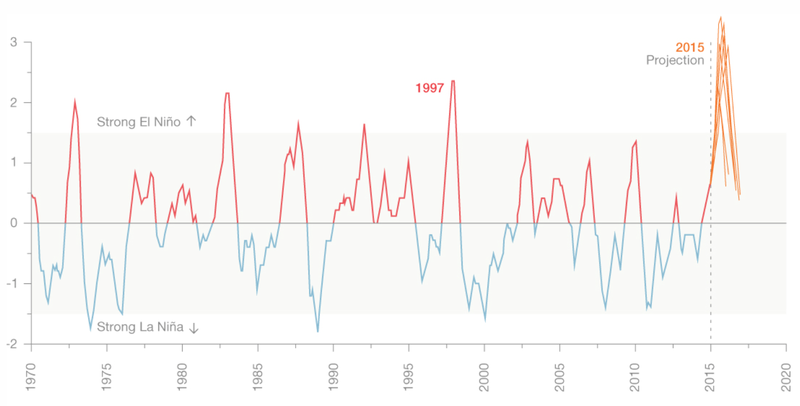 It too is clearly not the warmest in the period of record since 1979 and in fact, July is in the middle of the pack the last 20 years and the monthly data has declined the last decade. User beware if you are thinking of using the NOAA National Climate Data Center data. It is meant for creating headlines and ensuring we sell our souls to the UN in Paris later this year. P.S. much like 1954 1957…U.S. East Coast VERY VULNERABLE to major hurricane strike that form quickly in the warm western Atlantic. The MJO is moving out of the Atlantic and high pressure is building in eastern Canada. The exiting MJO is lowering air pressures over the “Col” in the SE U.S. and near Atlantic. That is a very dangerous setup. Tom, I’m curious, who or what are you basing your information on? Some people say the worst snow storm, kids say the best snow storm. In Fayetteville, NC snow is rare. I still remember tne great snow storm of 1955. (5.5 in) we were out of school for 2 weeks of sledding, snow ball fights, snowmen, and snow cream. Fantastic til we had to make up the 2 weeks in the summer in unairconditioned schools, whew. Also the great Hurricane Hazel made my uncle rich. He bought underwater lots, a motels, and a pier for a song at Sunset beach. So I’m looking forward to the dangerous set-up. Gary, The forecast Tom is refering to is the same as what Joe Bastardi is saying. I forecast Electric Power Loads for a living and I agree with Tom’s assessment of El Nino is not as strong as being reported and I seriously doubt there will be wide spread cataclysmic events caused by heat or El Nino. Satellite Temperatures are more accurate world measurements and NCEP world measurements used as input to Weather Models (Not Climate models) both agree that 2015 is not even close to hottest ever top 5 or 10 perhaps. Expect a worldwide spike in 2016 however, because El Nino floods the atmosphere with warmth. The increased destruction from heat is a myth and is not supported anywhere, not even by IPCC. Well, at least with actual data that is. Lot’s of guess work based on opinions is a completely different story. I guess we would have to ask why worldwide grain yields continue to rise in a very predictable manner? I for one am not looking for any change in agricultural problems unless we get some schotastic events like very large volcanoes. Spot on sir. Joe is part of my loose working group. We’ve all known each other for years and work for a combination of public and private concerns. I know folks within the NWS who have serious issues with the CPC. I spoke with a PIO for a regional NWS fcst office who told me that they did n internal study of CPC winter outlook and found a negative skill set in the East and elsewhere. I am a disciple of the NYU, MIT, PENN State pioneers and rely as much as I can on analogue methods. Domestic models have all kinds of feedback issues. What we do is such a great adjunct to this great site. I think its author is doing some really great work and hope this remains an open forum…Hurd Willet would be pleased. Yesterday I went long World Sugar futures and today’s up move was (finally) blamed on dryness meaning that Sugar has now become a “weather market”. It should be noted that about a month ago someone went long Sugar and said that Sugar was within 5% of their expected low but Sugar did go a little lower. I wonder if he got stopped out…. It should be noted that Chile has had only half the normal annual rainfall for ten years now. This El Nino could add with other factors and make a major drought in Brazil. Sugar looks like a falling knife to me, based on the chart. Not a sign of a bottoming process yet. The problem with the figures from NOAA as I have been informed, is that they fudge their numbers and not all recording stations are taken into consideration, so the statement that 2015 is the hottest on record is highly suspect. More likely, this is political reporting to support their phony man-made Global Warming scenarios where they want to Carbon Tax everyone for “our benefit”. and it is bad for our health and our planet. Co2 is not the problem, these clowns in our federal agencies such as the EPA and other alphabet agencies are the problem. I’ve generally stopped arguing with people about alleged global warming and use the seasonal forecasts as a divergence. i’ve noticed that the CME and others automatically use the CPC fcst gospel and the Fed is similarly confused. i think that’s why we keep hearing that their policy will be “data dependent” To me that’s code for. “we don’t have a clue what to believe concerning the upcoming weather” Again, warm sept in the East…high hurricabe risk…sudde cold there October and November…mild december…brutal Ja/feb///most snow concentrated late winter in east…Soke drought relief in southern Ca. Tom, I too have seen horrendous forecasts from the CPC over the years, to the point that I came to the conclusion that a seasonal forecast was not even possible, until I started following Joe B. and his forecasts. Growing up in Florida, I always respected Bill Gray and knew Joe B. because of his hurricane appearances here and there. In the past two yrs, I tracked Joe B. forecasts and I have been very pleased with his results. I find it embarassing that the NWS/CPC can be so horrendously wrong, but I have to admit, I do profit from it in the Nat Gas arena. The market does follow CPC and that can create opportunities. Ref global warming/climate change. If you google world temperature charts, you will find dozens. They show we are at the peak area of a normal warming trend. If it repeats as before we will go a little higher, then 500 years lower. How did man make CO2 to make the earth warmer during Roman times, middle ages, and 100,000 years ago? The earth’s atmosphere is 99% oxygen and nitrogen. Due to man, CO2 has risen from a normal maximum of 300 ppm to 400 ppm. That has gone from .03 to .04 % of the atmosphere. We have overloaded the carbon cycle. I say keep the natural balance, but temperature is not the reason. That first chart showing the warmest July ever, covers 135 years and the temp range is 2 degrees. So I will go with Gann’s Master Time Factor which calls for a rally early next year in commodities as a part of this 20 year bear market. we find co2 is a lagging correlate to the sun. Outgassing much like a soda bottle in the summer sun. Co2 as as a warming agent is a proposal without and attending simultaneous equation that differentiates co2 as a forcing mechanism as a component and in addition to a composite equation of integrated forcing and dispersion equation as a control to back test. That would be the basis for creating a “theory” or “Law” of global warming induced by co2. To summarize and partially differentiated simultaneous equation with CO2 is required. Personally, I find the world bond markets the best proxy for temperature variance and I can explain more when I have time. Tom, interesting thoughts, but many of your sentences make very hard reading, possibly due to typos. IPad user maybe? I am a Mac user….Looks ok on my computer so maybe a problem in transit? Maybe it’s me, bu the above is just a bunch of words. Too big many of them. That I can understand, thanks Tom. Given that man-made warming appears to be a political fiction, that equation will never arrive of course. A mini-ice-age should dispel some myths perhaps. My work shows that El Niño and global temperature correlate with the 3,5 year cycle. So does earthquakes. Longer term temperature correlate with the 22 year solar magnetic cycle. So does human births and other factors. 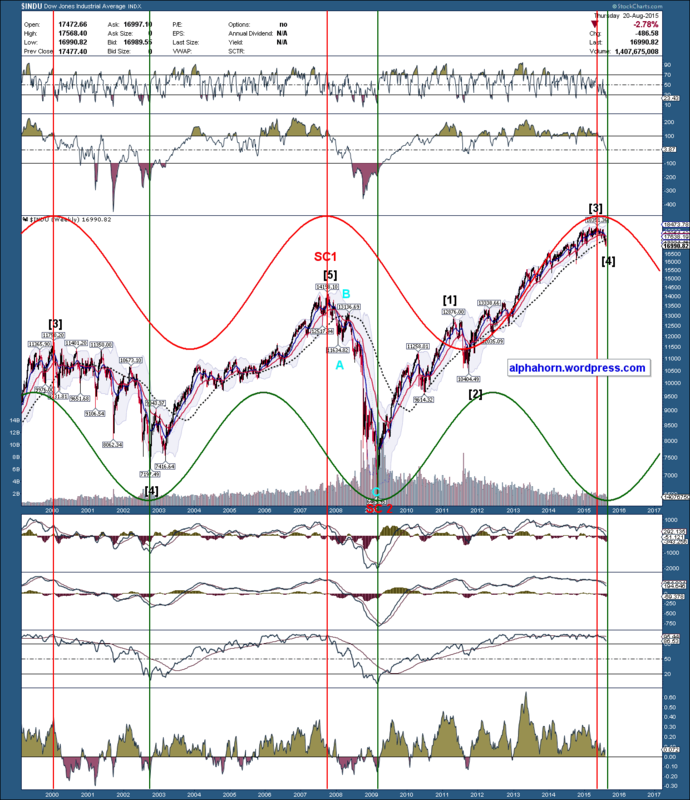 SPX is still around its 3,5 year cycle top, and has stretched it. Ideally it would have broken down ~1 year ago. On the other hand SPX breaks either before/around solar maximum, or 12+ months after solar maximum. Solar maximum was April 2014, and therefore markets have held up until now. Cycles all line up for a bear market now. Short term SPX missed a breakdown opportunity and bounced up. The short term cycle is about ~1 month, and right now it is not in phase with the more known lunar cycle. This bounce however is weak and may break down soon. SPX is making some kind of a triangle, and breakouts can be volatile. But still room for upside this week. I’m giving the Dax this week to return above 11k or I’m shorting it down to 10k and below as per what the technicals seem to point to. Investors don’t see the value in it like I do and there is almost no confidence in the index. First short at 10900 if it reaches there today. Karni, looks like your impulse higher is done. Kudos to krish for recognising the dominant trend. Yes the impulse lower is done:) Do not tell, that I did not warned you when the bears get skinned again. There is also a big gap at 11300 which may be filled although not sure how with the weak sentiment at the moment. The only positive for the bulls is a lot of the negatives have now been priced in. karni, in real time you are being proven wrong. There will certainly be a bounce at some point, but surely you will accept the bears are taking control of these markets? Or will you persist to keep your head in the sand I wonder? @krish…value comes way lower, in a couple of years, maybe c. 6,000 for the Dax. I’ll need to research the individual dax companies to determine when the index is a good buy. It won’t fall forever and at some point it becomes undervalued. The only issue I have with shorting is that any positives lead to huge rallies so will be keeping stops tight. Don’t want to lose all my profits shorting into a big rise like i did in 2013 and part of 2014. All this money being pulled out the market is also sitting in banks earning 0% interest so eventually buyers will return. But until then I think we go lower. Given that I am a crusty old cynic, I have a problem with any of these pseudo science journalists who don’t have an academic or practical background in science. At best we can say that they “believe” the research that is presented and a s a function of volume, consensus and vidness; all logical fallacies. Same thing with Paul Farell of marketwatch. I.E. consensus is the stuff of politics. Science is the stuff of science. Dr Farell now cites the moral authority of the Pope as validation. So now we are accept that theology and science are one. Truly and in those circles of influence, the Age Of Reason is a distant memory at best. Scientists without interference are so rare. They have extremely short half-life. They hide and if become known as ingenious are then hidden. If they uncover something that will either make money or stop the making of money they will promptly disappear. Which box are you in? If you be real why you still here? Peter. That is because I work solely for myself and from my home and am 60 years old. I also worked in the U.S. media for years and so I have a natural contrarion best given the laziness and duplicity that I witnessed. i also believe that people simply must understand how the physical world actually works around them to better understand behavioral economics and demand influences. The deflationary implications of low solar and colder temperatures functionally cuts against Keynesian economics and Central bank intervention. I believe that is precisely what is playing out. While Europe and China are devaluing, for now at least, the U.S.is winning the currency war. The rest of the world seems to be pushing against a rope and creating temporary bubbles as asset class positions change radically rather than money velocity increasing which happens naturally at solar maxes. Think of what happens in any wave function when speed increases…Wave lengths increase. When money velocity slows amplitude increases and time duration wave lengths decrease. In deflationary solar and cold cycles bubbles happen more frequently with central bank intervention. These are just my insights and of course open to debate. Ager all I’m just a semi retired meteorologist working froma little island. Tom, what happens if you’re wrong in your analysis and other scientists are right? The man made climate changers have a hypothesis based on correlation is causation. Tempetature and CO2 historical charts have correlated. Unfortunately for them, temp actually started up first. So they have proceeded ahead even though they no longer have a hypothesis, much less a theory. Really intereting article John. 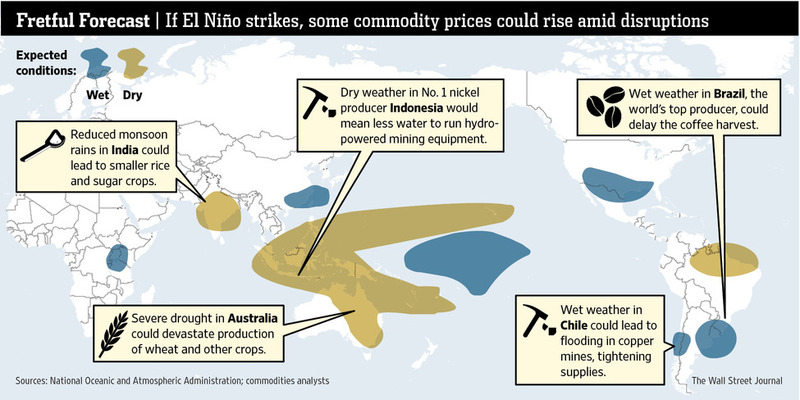 Living on the east coast of Australia I am very aware of the significant impact El Niño has, not just upon weather but also its financial impact. Australia went through a similar situation that California now faces and which culminated in the south eastern bushfires in Victoria that reulted in the loss of nearly 200 lives and thousands of homes in 2009. For any Californians present I find it very odd that you have taken measures to drought proif yourselves by building desalination plants as was done in Sydney nearly a decade ago….very odd indeed? On another issue, WOWEE,……junk market blowing up BIG time. Hold on to your hats. You literally can not surive more than 3 days without water,so why wouldn’t Californian officials take measures to insure against possible castrophic financial and human losses? The reason is because they are out of money. How many articles came out in defense of Detroit by newspapers? Does Stockton tell any stories? So it is ok to leave bond holders high and dry and expect lenders to keep lining up? Cali has reduced their budgets from pure need. The only thing Cali has that most places do not is people actually want to live their. Both large and small business have chosen to leave or build further in low tax states. I’d say we are looking at a real life experiment in Cali. They might pull it off, but it will be a rich/poor state. Middle is leaving in droves. well,California has total debts of around $775billion, a large chunk of which is unfunded pension liabilities. If it was a company it would be insolvent, but as a governmental body is probably “typical”. Don’t disagree with your premise, J, but money is there and is being spent. One might not like HOW it’s being spent, but that’s for another forum, lol. Such is the American way, drive it hard over that cliff. Go baby. I very briefly chatted to 3 very loud young American women on holiday last year, on the queue for water – skiing. They were from California. I asked what it was like there, how the drought was affecting things. They looked at me with blank faces, not a single clue. Maybe one day the water and the money runs out, then they’ll notice. Droughts in CA also follow the solar cycle. Man has also caused it, but the next 5 years will probably get better before it gets worse again. I believe that there is a defacto or implicit carry trade between all adjacent geographic locations with tied currencies with respect to those that are cold and those that are warm. In the U.S. it is California (and Puerto Rico) that are warm and the rest of the U.S. being cold with lower nominal and real interest rates. This is not a coincidence. The variance in interest rates AND low nominal interest rates is lowest at high latitudes with the equal and opposite in scale and magnitude occurring at the equator. Greek and other southern countries are experiencing the same thing in Europe. Part of this is the sun. However, we note that Columbia and Equador have the same interest rates as Chile and Canada. That is because although they receive more sun, the popultation lives at 5-6000 ft which is cooler and is equivalent to living 1500-1800 miles closer to the South Pole. John Li, Are you aware of the recent scientific paper that explained in detail what most scientist already knew?……. Cali has droughts!!!! It is not due to global warming!!!! and Cali had droughts hundreds of years long, prior to 350ppm!!! On top of that, a warmer world means more rain for Cali!!! So if I were living in Cali, I would be praying for a warm world. I didn’t see the paper, but I just googled it and I saw that droughts were last in 2000, 1990, 1980…hmm all solar maxs. Sounds like we have similar backgrounds (media), ages (with a general adoration of cynicism) and a general understanding of what’s going on with climate. You might find interesting a little video I did last week on climate and the DOW. http://worldcyclesinstitute.com/dont-like-the-climate-wait-a-cycle/ I’d be interested in knowing more about your data source for temp and precip as I’m going to be speaking for a group called Friends of Science (they think some yellow fire ball has something to do with ups and downs of climate … haha). Excellent…..I speak daily with Joe Daleo for one…Check out his site icecap.us..also friends with Bastardi and Anthony Watts….I believe Joe D will be joining us here. He has the best data via Weatherbell analytics. I’m not much into the Gore/Strong view of the world … haha. What’s “PDO?” My view of climate rests with all the astrophysicist studies on planet influences … more videos to come on that. Really like your comments here. Keep it up! how will the coming moon wobble play out ? compared to the last 2. !! Well just as expected Monday was clearly another distribution day and another sign that these markets are not going to new ATH’s soon and may just be about to tank if the SPx takes out both the 50 day and 50 week almost simultaneously. 2060 looks like being significant. Yeah Gary I mentioned the other day how many global indices looked pretty ominous in Europe and Asia. The ASX and FTSE both look extra bad, possibly the commodity weighting in both? Would not be surprised however, to see the US indices run again and further distribution. I am not sure what your conclusion is…I hear that Bradley has some seasonality every year, and not just every 7 years. Anyway, the level of Bradley does not matter, but the changes and rate of change. WOW!! Steve T’s volatility prediction is coming true ALL IN ONE DAY. The DJIA has been ‘down, up, down’ by 200+ points today. My trading account will be ready to go and funded by tomorrow, just in time for shorting ahead of (potential) waterfall declines. I’m pondering which indices to short, and which short ETFs to use. I am not keen on the 2x or 3x trackers though. Use the 3x trackers with 1/3 of your account, gives you more trading reps than putting 100% down on a 1x etf. Because you have to wait T plus 3 to make another settled fund trade, which slows down trading if in a 1x etf. (T plus 3 is trade day plus 3 calendar days for funds from previous sale to become settled funds). GM is finally getting into the game! Good luck! I’m only looking to trade cautiously for 6 months or so, ready to buy into some junior gold miners with these funds, as they re-test the recent bottom. Many here have mentioned Jan 2016, and that is also Armstrong’s second benchmark. Maybe a lower low for gold, a marginally higher low for miners. I’ll hold on then for a couple of years, hoping for a few 20-baggers. This is dangerous time right now. I predict a preliminary market panic sell or mini crash on Mon Aug 24. This is the first volley and it will likely rebound hard mid-week to set up for a bigger panic later in Sep. There is opportunity on both sides if you are alert and quick. Today is a CRAZY example of it … my head is still spinning from the volatility!!! Steve, what volitility?………the VIX is hardly off the canvas, however I agree this is getting really dangerous. Markets cheering as the Fed minutes basically lay out thatnthe global economy is in full blown deflation and it has little that it can do about it. it needs to climb up to 210 before we can short or else you are shorting in hole. Agree, Bill, however, a quick scalping short may be possible into this Friday’s opex in US. Expect further weakness until Friday afternoon which may be tradable. I guess Sept 18 will mark a top for a bigger decline into Oktober.. The VIX is a fricken joke! At least gold and its miners are up. Mate I’m calm, just peeved that central planners have wasted 7 years on QE that has done nothing other than line the pckets of bankers and genuinely concerned for he future of my kids and grandkids. Oh and the VIX, it is a joke. A deeper perspective Allan: all of the central bankers know what is coming, and all of them bar one is dictated to by govts and ultimately by the populations of those countries, none of whom want the debt-fuelled gravy train to end. People drive it, the world has become accustomed to easy times, ever since the great wars, we’ve moved into bubble-land, with c. $60,000,000,000,000 of global debt (plus unfunded liabilities). Mad. Sadly, there is no way out of all of this without terrific pain and settling at a much lower level of economic activity, especially for the West. But gold up at $50k an ounce (in today’s terms) will rescue the East, and we’ll start over again, with a new system, far less debt, and never to return to the bubble of the past 100 years (well, not for our lifetimes and a few more at least). Give the CBs a break, they’re stuck in the middle of a bunch of monkeys (voters & politicians), who’d want that job!! It was a new moon on 14th August, so lunar weakness becoming evident already. GM, have observed interesting phenom about daily silver futures. AG rallies hour before to hour after moon rises. Flat lines. Then AG falls hour before to hour after moon sets. I wish I had the capital to trade this as it often has whippy action during the sell offs and rising which would stop a small account out. But the over all action if traded nimbly with one contract and a large margin could be very tempting. Interesting. Not for me though, I like my sleep too much. During new moon phase it rises and sets with sun, so hypothetically you could trade it during daylight hours. Someday, when I have a larger margin account would like to trade it. Btw, the miners are in rally mode. Hope it continues. I’m rarely out of bed before 9am, ashamed to admit! Nice to see GDXJ rising, post VIC as expected, should last two months at least, lots of room on the upside. Seasonals: up until Monday after opex, down Tuesday to Friday next week. Summary: Went short at top today. Will stay short even tho’ we may get opex happiness next two days. Will exit short on Friday if 1.5% obtained. Will remain short into next week until 1.5% obtained. Won’t look to the long side until at least next Monday. I was long around 2085 and waiting to go short at 2100. I thought you planned to stay long this week, next week is seasonal -ve week. I am waiting for overbaught condition ..probably see a high on monday and reverse then. Yes, I thought the same – Valley, did the plan change? I said probably cause to make any real money using PALS you have to respond to intraday to overbought oversold conditions. When I saw market break down after Fed announcement, combined with unfavorable lunars I realized a sell off would occur that would last at least until Friday morning. So I went short, reversed this morning going long into opex Friday where I expect market to retrace. Will go short again on Friday. P.S. — Mae is absolutely right about chemtrails and geoengineering. They are quite real and widespread. right in the middle of my window atm. would roll over, let’s see. not have been for me in a similar position. Phil, not easy? ?……..not bloody hard either! As I explained last week people look at gold soley from a USD perspective and can’t work it out at all. Martin A himself makes the same mistake. My physical holdings are up in AUD and virtually all of my Oz miners are up. One in particular over 500%. There is only ONE place to be going into this global financial catastrophe. Couldn’t be happier with where I am. I had a conversation with somebody last week about gold. The guy said to me he was going to buy gold if it dropped to $1k. I sptold him that IF gold dropped to 1k it would be because the USD had gained in strength which would likely mean that the AUD had deppreciated and thus AUD gold price would more than likely not drop and probably rise. Talk about a blank stare!! I’m with Allan on gold Phil, and I have to say, I’ve rejoiced at these price levels,, and bought greedily into physical and miners, happy days. One more dip in the New Year would be absolutely fine, before we see the start of a long gold bull that will amaze most in the markets (also the collapse of the world economy and debt bubble will be quite amazing to behold). Yeah GM most investors have no idea about gold. They see it in a very simplistic, myopic and only ever from a USD perspective. Oh and isn’t it funny how gold is rallying on the back of a SM decline?…….that’s exactly what some us have been beating the drum on. I’ll say it again, to those think the USD will automatically serve as a safe-haven and draw in capital if global markets tank……think again! The reverse happened in 2001 due to capital out-flows from the US after the dot com bubble burst as overseas investors that had piled in after the LTCM collapse and Asian currency crisis withdrew their capital enmasse. Gold and gold shares exploded in the years after. Look at me….look at me….LOOK AT ME….!!!!!!!! your own performance, but keep laughing if it helps. a bull market top, let’s see how it develops. If it’s just a correction the call was incorrect. I’m not bothered either way about your window call Phil. But wasn’t the top back in May (for US markets)? S&P reached 2134 intraday twice, hasn’t got back to those levels. Also, daily closing high was in May. Just curious why you think now is the top, when prices seem to say not? I am confused. Are you calling for a market top or correction? You only have to keep reminding the board endlessly about guessing what might happen in order to………yeah why? Look at me, look at me, look at me….just look…..ffs…. How about we forget all this and congratulate Mr. Hampson for all the fine work he’s done and hopefully the profits he’s ringing up being short. Well done, John, happy for you. Now I’ve just jinxed him, lol. On the DJIA it is beginning to look like we are approaching the right neckline of a large H&S starting back in first part of Dec’14. If that’s the case then we should be setting up for a bounce for the right shoulder any time soon. will any of us still be here when the biowrecks are 80-85% lower? He is still on vacation. Might be a sabbatical. We can set our watches for his return date though, next big up day. Hello Nic, hope you’re doing OK out there. Bless him. Love this site. The markets were in a perfect position to break down on Monday. They waited until today. The breakdowns are classic. The DOW was already below its 200 ma and needs 2000 pts to turn the 200 ma down and the rally back to its then downward moving 200 day. The S&P has been sitting on its flattening 200 day. Break downs often occur from such positions. Every time since 2009, nearness to the 200 day was a perfect buy the dip. Gold was in a similar position in Jan 2013. All dips to the 200ma were perfect buy pts for over 10 years. It was sitting on the 200 day oversold and all the gold touters were screaming buy, oops breakdown. The NYA ditto plus the Nasdaq. Typically this would be a 1 down. Considering everything, esp China, if this is not it, will have to become a Nicholas bull forever. My sources tell me that some entities are furious with the Farmers Almanac call for a cold winter east if the Rockies. First, they will be right. Second, Q3 is already weak and commodities are are breaking down as we all know. Third, the sun is rolling over….rhetorical question; how can long bonds and other deflation proxies not continue to rally? This is amazing. Woo Hoo….Below 17K on the DJIA!! Well done BEARS!! from peggy on twitter >> Spiral has rotated 360* to same octet (and price) as 8/12 low – we have gone backward in time since 8/17. short term? high 8/22-23, low 8/27-28. This Expansion is a slow moving one. 8/20 11:21 Spiral has rotated 360* to same octet (and price) as 8/12 low – we have gone backward in time since 8/17. Expansion high due 9/11. Long term cycle is down to price target 515. Hi Peggy, does this mean you expect a replay of last week (8/12) with higher prices to follow till 9/11? I assume this means the current dip is to be bought? The Spiral radius is expanding so 2037 is possible. Upside targets from the Singularity low on 8/12 are 2103 (hit), 2111 and 2120. Peggy, I assume the fact that the upside has been hit (2103) doesn’t negate that the possible price top targets of 2,103, 2111 and 2120 are still in play for 9/11? 1. I’ve read that El Nino only brings higher than average rain to Calif. if the trade winds cooperate. To the meteorologists on the board: is there any evidence the trades may cooperate this season? 2. What many people don’t realize about Calif. is the state exports about 80% of its water via agricultural produce. the 37 M residents use about 20% of the water. 3. I believe some cities in San Diego area are investing in desalination. But this is only for urban populations, obviously this isn’t going to resolve the 80% of the water used for ag. 4. What matters in Calif. is not just precipitation but snow. If it’s too warm for snow to fall and stay frozen in the Sierra, there’s flooding. What’s needed is heavy snow /snowpack at high elevations. the snow is the critical reservoir. 5. To the meteorologists on the board:are there any clues as to temps in Calif/west coast this winter? Our work indicates that there will be drought relief in California , though the “Godzilla” El Nino scenario seems a stretch. There have been forecasts of a 2.4 and a 1.8 peaking in October or close to both appears more likely. Under companion circumstances, this El Nino’s affect will be on the southern branch of the jet stream. Whta can happen with the so called PNA at it’s broadest later in the winter is that the cold sets up first in the Great Basin and Rockies and with the souther jet strong The Sierra Nevada and southern Rockies receive lots of snow early. maybe late October/November. That’s what my imagination sees as very possible…It is critical to watch the path of typhoons in the WESTPAC in relation to the convergent components created by El Nino and also the SOI in developing the PNA and downstream trough in eastern U.S. SOI has been skewing strongly negative which favors that….In my estimation that also is bullish for the bond market heading into that time frame. Now long (short since yest. afternoon). Opex tomorrow snap back rally to begin any minute. Lol, I’ve been sat here for 40 minutes trying to find a US ETF that I’m allowed to trade within my ISA (tax-free investment), but to no avail. (Any UK investors found a way round that BTW). So, I decide to use Berkshire Hathaway instead (good proxy I thought). Just about to deal (long trade), and I can’t do it, as I need to fill out and send in a bloody US form for overseas investors. I was going long because bollinger bands have been broken, and I saw lateral support on the S&P. Don’t you think we will have a rally for at least few days after being so oversold. So if we are at 2080 by friday afternoon you will target 2020 by next week? What are the lunar tuner for next week. Long into opex. Have bullish bias next week based PALS and market weakness. its getting ugly are u exiting longs..if its abounce we may get a big bounce. I closed my Sep puts, Nikkei shorts and went long SPX 2048 with 10 point stop. I don’t have a lot of exposure at the moment, need to wait for a better entry for larger positions. Trading is one thing, standing in front of a freight train is another??? SPX gaps down and proceeds to break major support. Bounce due soon, but the writing is now in a safety deposit box. Primary IV receives energy from a cold turkey in the mirror. How do you know where/when to draw the pitchforks in the first place please? The data cited by “Globull Warmists” is fudged. World has been cooling since 1997. Follows solar activity……what a surprise. NOT. We would find the surface observation input data provided by NOAA for the initiation of climate models be compared to the same satellite input data utilized by NCEP for their short range operational models as a “control”. NCEP is accountable for near time forecasts longer range. Their seasonal forecasts have been ongoing failures.